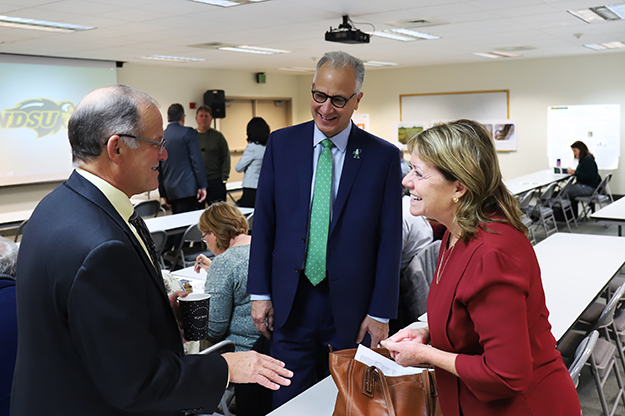 Making stops across western North Dakota, Mark Kennedy (left) and Dean Bresciani, the presidents of the state’s two largest research engines, UND and NDSU, respectively, posited a boost in research funding as a means to diversify the North Dakotan economy. Photo by Connor Murphy/UND Today. 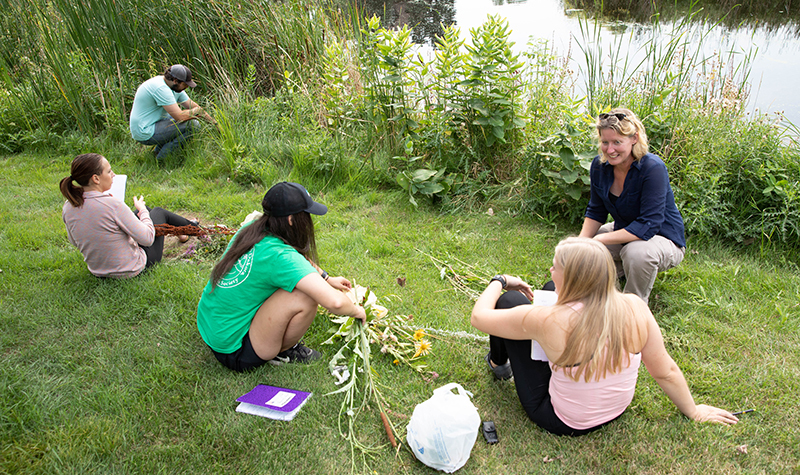 Investing in research at North Dakota’s two research universities will lead to diversifying the state’s economy beyond the reliance of agriculture and energy. 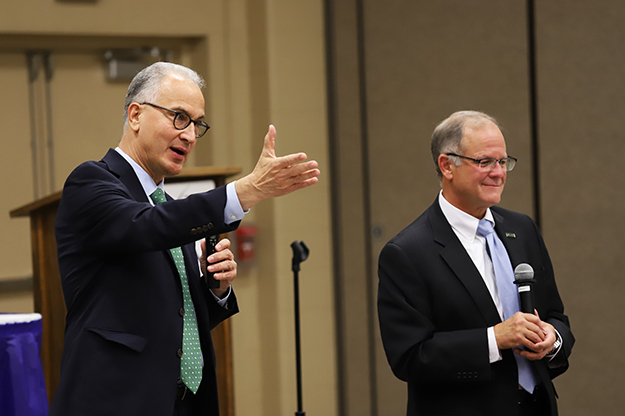 That was the message of UND and NDSU Presidents Mark Kennedy and Dean Bresciani to the people of western North Dakota last week, in stops at Minot, Bismarck, Williston, Watford City and Dickinson. The presidents of the state’s largest research universities posed the potential for specialized research funding, separate from established state appropriations for higher education. Their request: $100 million split between the two universities over the next legislative biennium. By establishing state funding for research as a block grant, the two universities could be more nimble and viable in competing for large federal grants, as well as pursuing research areas connected to the needs of the state with huge potential returns on investment, the presidents said. 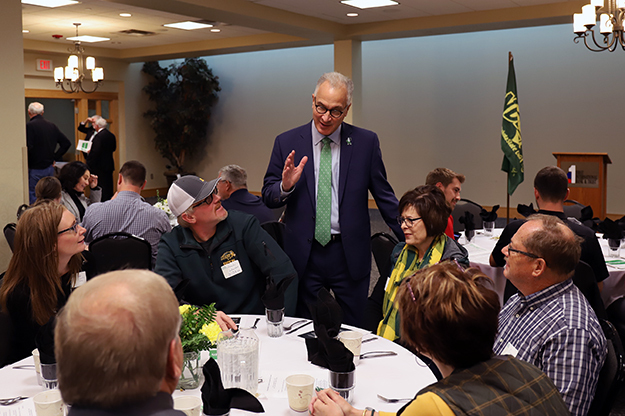 Watford City proved a venue for loyal UND and NDSU alumni as the presidents made their combined case for increases in research funds for the the two universities. Bresciani described the presidents’ joint appearance as “extraordinary and unusual.” Photo by Connor Murphy/UND Today. 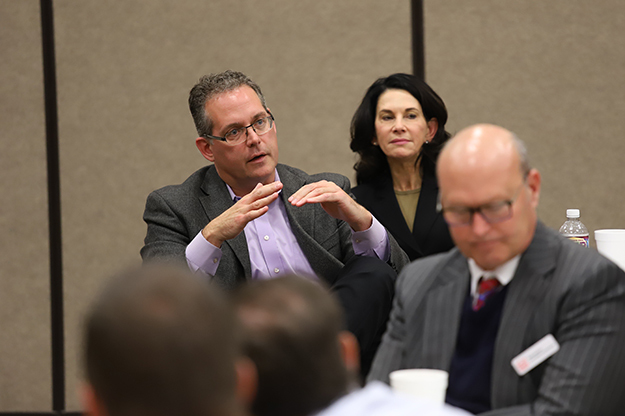 Kennedy, at all five stops, pointed attendees to UND’s five Grand Challenges (research foci in biomedicine, rural health, unmanned systems, energy and sustainability, and Big Data upgrades), saying that all have a role in driving economic development. “I believe with universities and the impact they can have on the state, if we’re not focusing on that, we’re not going to keep up with the other research engines that thrive in other states,” he said. Bresciani says that in his 35 years in higher education across nine states, North Dakota is the only one without funding specifically for research. With the research enterprises at both universities, gaining the tools to become competitive would be a boon to business diversification, workforce development and growth in general. 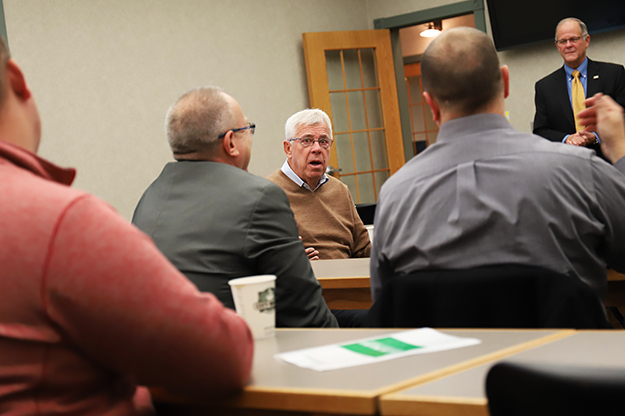 The presidents’ tour of western North Dakota happened at the behest of the Valley Prosperity Partnership (VPP), an economic development group comprised of Red River Valley business and community leaders. It’s co-chaired by Border States Electric CEO Tammy Miller and AE2S CEO Steve Burian. Among the groups hearing out the two presidents and VPP co-chairs, questions ranged from how university research is commercialized to how the amount they’re requesting came about. Regarding commercialization, Bresciani cited the close connections the state has to industry. Given its small size, needs of industry are known and communications are close-knit, he said. 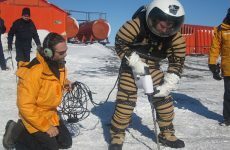 If research entities had readily available funding, such an environment could create rapid responses to industry needs. The $25 million per year, per university, came from scaling down a model that exists in Texas called the Permanent University Fund (PUF) – a provision written into the state constitution. Granting two research universities significant land and mineral rights brought in $1 billion for the University of Texas over the last biennium. While this constitutional example is an aspirational model, both presidents stated that $100 million over two years is a fraction of what’s earned in interest by the state’s Legacy Fund, which collects a percentage of state oil and gas tax revenue. The other idea for funding stems from profits made by the Bank of North Dakota, an institution that could also serve as an apolitical review board to ensure proper use of block grant funding. Eric Hardmeyer, the bank’s president, says diversifying the economy – one way or another – has been in conversation for quite some time. His takeaway is that universities are working with every facet of state leadership toward that goal. Rich Wardner, State Senate Majority Leader, was vocal – both during and after the presidents’ visit – about the importance of establishing trust with the state’s legislative bodies. And research, in his view, is a worthy investment. Photo by Connor Murphy/UND Today. North Dakota Senate Majority Leader Rich Wardner said there’s no question that the presidents’ block grant proposal qualifies as a “legacy” project worthy of investment. After hearing the presidents’ presentation in his home base of Dickinson, Wardner thought it was a good start to a larger trust-building process. In Minot, State Sen. Randy Burkhard concurred that the proposal is worth considering. He says if the state isn’t moving forward, it’s moving backwards. Steve Burian, left, and Tammy Miller, background, co-chair the Valley Prosperity Partnership. Through their experience as economic development leaders, they feel now is the time to significantly diversify the economy through University-based research. He talked about the potential for large returns on investment from talent attraction, workforce development and research commercialization. Photo by Connor Murphy/UND Today. Border States Electric’s Miller led the gatherings of economic, health and civic leaders with her company’s history illustrating the need to diversify the oil and soil cycles of commodity pricing. Founded in the 1950s in Grand Forks, Border States Electric played a key role in western North Dakota’s development as a wholesaler of electrical materials and equipment. With heavy reliance on oil and agriculture, employment grew and new locations were established. Miller said oil tanked in the 1980s and negatively impacted their business. At that time, company leaders decided the business was too dependent on North Dakotan commodities and needed to diversify. That led to an acquisition, outside of the region, in Albuquerque, NM. Since then, the company has continued to expand in other states to further diversify the company from dramatic swings in oil and agriculture. Miller says the company’s growth continues to create jobs in North Dakota, home to their headquarters. The idea of utilizing the talents and expertise of North Dakota’s two research universities to strengthen the state’s economy has been in development since 2012, explained Burian. His civil engineering firm, based in Grand Forks, also has an established statewide presence, and he too sees the need for diversification. Co-chairing the VPP with Miller resulted in the development of a strategic plan, a tenant of which is boosted research at the state’s two Carnegie-classified research universities: UND and NDSU. At Williston’s NDSU Research Extension Center, Kathleen Neset was impressed by the diversity of citizens hearing the presidents’ pitch. As a private-sector consulting geologist and member of the State Board of Higher Education, she says research impacts everyone in the state. Photo by Connor Murphy/UND Today. That isn’t to say agriculture and energy are going away as major research focuses. Kennedy cited energy as UND’s primary research area, and improving oil extraction in the Bakken by one percentage point has a $3 billion economic impact for North Dakota. In agriculture, NDSU’s research extensions throughout western North Dakota are improving crop outcomes, which has led to more crops being raised and harvested in more portions of the state. Still, a more diversified economy will ease the burdens of low pricing swings that affect all areas of the state. At Williston’s NDSU Research Extension Center, Kathleen Neset admired the diverse group of leaders, citizens and researchers, young and old, hearing what the presidents and VPP had to say. As a geologist, president of Neset Consulting Services, Inc. (providing oil well site geologic services) and a member of the State Board of Higher Education, university-level research affects her livelihood.